Under Clouds—Steve Johnson and I had the continued privilege to establish another new route just above the Mine that sits above Telluride. Shown above, the main crack system in the middle of the face. Pitch 1: ascends a slightly grungy left facing corner, then up ledges that take you up and right to an anchor (Gear: small fingers to hands). Pitch 2: head up and right then work your way up and left, past four bolts into the OW up to the anchor (Gear: 5 draws, Camalots up to #6). Pitch 3: continue up the OW/crack breaking right just before the top passing two bolts on fun easy face-climbing (Gear: Camalot to #6 and two draws). Careful, there is very loose rock on the top ledge 300 ft up. At this point you need two ropes for this route as the top pitch is 130’ and with two 60m lines you can make the ground from the second anchor—saving on time. 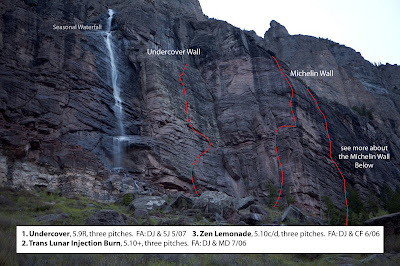 FA: Undercover, 5.9R, three pitches. Damon Johnston & Steve Johnson 5-19-07.